Assailants abducted and beheaded an Afghan intelligence service employee and struck one of the agency's vehicles with a remote-controlled bomb in a separate attack, killing six employees and wounding three, officials said Monday. Also, a roadside bomb hit police Monday as they were patrolling in Afghanistan's volatile south, killing two policemen and wounding five others, a district chief said. The incident occurred in the Shamulzayi district of Zabul province, said district chief Wazir Mohammad Khan. He said that among the five police wounded, two suffered serious injuries. The latest violence follows a bomb attack Sunday that killed two intelligence service officers, a soldier and a driver in Mehtar Lam, the capital of eastern Laghman province. On Monday in Laghman's Alingar district, an intelligence service vehicle driving from neighboring Nuristan province was hit by a remote-controlled bomb, said provincial police chief Abdul Karim. He said six of the agency's workers were killed, while three others were wounded. Another remote-controlled roadside bomb was used Sunday to kill the two intelligence service officers, a soldier and their driver, said Laghman provincial police chief Abdul Karim. 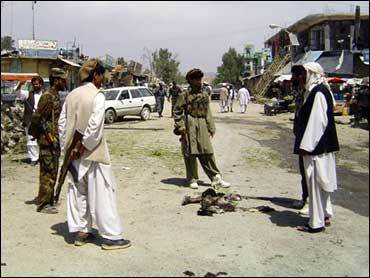 The attack took place in the provincial capital, Mehtar Lam. "The enemy is not brave enough to fight face-to-face with the Afghan army," Karim said. "They have to resort to suicide and roadside bombs." In Ghazni province, southwest of Kabul, an intelligence service employee was invited into a home, then kidnapped and beheaded Sunday by the Taliban, deputy governor Mohammad Kazim Allayar said Monday. He said the owner of the house is under investigation. On Saturday, a suicide bomber blew himself up in the eastern city of Khost, killing six civilians and wounding 40 others, officials said. The latest violence came as NATO and Afghan troops pushed forward with their largest-ever offensive, launched last month in southern Afghanistan to flush out Taliban militants from the northern tip of opium-producing Helmand province. Scores of militants have been killed in a campaign aimed at facilitating economic development and to persuade Afghans to support President Hamid Karzai's feeble government.